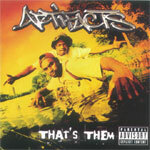 The Artifacts dropping a gem on us!!!! Quality Hip Hop. Guest appearances by Lord Finesse and Lord Jamar. 5. Where Yo Skillz At?